Some of you may have noticed that I haven’t been posting quite as often lately. I did take some time off after the 2010 Knapp Family Reunion. It was great fun – but I had some other things I needed to catch up on. Plus a little downtime, relaxing with the family and a few good friends – doesn’t hurt, either. One way I relax is by noodling around on my computer and doing genealogy research. This week I decided to try and figure out what happened to a son of Matthias TRARES, our immigrant ancestor on the TRARES side. Barbara TRARES: married John Adam KLINE (son of Peter KLINE and Barbara GRIESEMER). Their son was Henry C. KLINE (Florence Cora KLINE’s dad). Margaret TRARES: Married a man named LONG and died in 1919. I know little about her at this point. John Sebastian TRARES: I knew nothing except his approximate birthdate: 1835. Peter TRARES: I know little about Peter, too, at this time. How do I know approximately when Matthias TRARES and family left Germany? His son, John Sebastian TRARES, was born in Germany, while his youngest child, Peter, was born in Ohio. So I can assume that he left Germany sometime between 1835 and 1838. I decided to play detective and figure out what happened to some of the other members of the family. I started with John Sebastian TRARES because men didn’t change their names when they get married like women did during that time period. So they are easier to trace. I had one thing going for me: TRARES is a relatively uncommon name. Usually, if you see that name, chances are they are related in some way. That makes genealogy research a little easier. Not like researching the SCHMID side of my own mother’s family, for example. Do you have any idea how many SCHMIDs there are in Ohio???? One of the first things I do when starting out a search is to perform an internet search on a person’s name. You never know what may pop up. I will also do an image search to see what I find. Well, I got a surprise when I did both on John Sebastian TRARES. 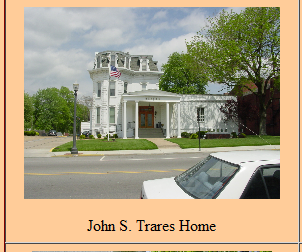 As it turns out, there is a building known as the John Sebastian TRARES building located in Edwardsville, Ill., (in Madison County), that is listed as a local landmark. Hmmm…. Here is a link to the City of Edwardsville’s website. You can check it out for yourself. But this is what I found below. You can click on the thumbnail image to see a larger version. Then I noticed a listing for the John Sebastian TRARES home. Apparently, the Edwardsville schools does a History Walk each year and takes photos and posts them to their site. The kids get to talk to people dressed in period costume who are playing the part of founders of their town. Kind of a neat idea and great fun for the kids, I’m sure. But one of the photos was of the home of John Sebastian TRARES. Hmmm…it’s a pretty sizable home, built in the Empire style. Obviously, this was a pretty influential member of this community. Wow! An Empire-style mansion! This guy must have been quite an influential man in the community at that time. This was quite a house for the pre-1900 era. Well, that just intrigued me all the more. Obviously, this guy was probably not farming if he was able to afford such a fine home right on Main Street in downtown Edwardsville. Stay tuned for tomorrow’s post when I tell you the rest of the story of what happened to John Sebastian TRARES and his family. This entry was posted in Family History, Local History, Photos and tagged Edwardsville Illinois, John Sebastian Trares. Bookmark the permalink.